Remember awhile back when I worked my way through every Liz Lovely gluten-free cookie available? And so is Liz Lovely. In fact, they recently just got their certification. Certified. Certified for goodness, of course. But this is HUGE. Liz Lovely is now CERTIFIED 100% FREE OF WHEAT, DAIRY, AND EGGS! Yep. It means this cookie monster has more cookies from this amazing company at my disposal. My taste buds are ready! While out at my local natural food store, I spotted the Liz Lovely shelf that I usually walk to and stare longingly at for a little while. Most of the time I can talk myself out of purchasing a pack of 2 cookies…but this had varieties I had yet to try. I got the roomie to consent to one item off the grocery list/budget this week and we brought home Liz Lovely’s Gluten-Free Cowboy Cookies. Previously, you could only get this version done vegan…now it’s both. And I am one very happy cookie monster. So, what is a cowboy cookie? Well, it’s a hearty cookie for one thing. Usually they contain oats, chocolate chips and some sort of nut. Sometimes…coconut is included. In the case of Liz Lovely’s variety of Cowboy Cookies, you get a magical combination of oats, chocolate chips and walnuts. YUMMY!! The base of her cookie is dipped in delicious dark chocolate and the top has some nice dark chocolate stripes. It looked amazing. Sounded delicious. And after dinner last night, I split one in half with my roommate and we enjoyed a gluten-free Cowboy Cookie dessert. On Liz Lovely’s Web site, she gives a little background as to how the Cowboy Cookies reinvented the idea of the original business concept. Liz Lovely was originally going to do vegan truffles, but it turns out, one night before hosting a tasting party, Liz had extra chocolate but no more centers…so she quickly baked up some oatmeal chocolate-chip cookies and drizzled the extra chocolate all over them. The truffles were all but forgotten at the party. The cookies were the hit. So, the next day, it was decided…Liz Lovely would be a cookie company. Cowboy Cookies…that’s what made it happen. I can see why too! These cookies are fantastic. Way better than I could even imagine a vegan truffle to be (although I love vegan truffles too). My first dessert love is a cookie…always and forever…so this was a very nice treat. The oats in the dough give it this fantastic texture and a bit of sustenance. The chocolate chips bring the sweetness. And those walnuts…not only add a bit of a crunch, but that saltiness that pairs well with the chocolate. I love how the extra chocolate on the bottom and top of the cookie meshes with the rest of the flavors. It is one sweet, hearty, delicious bite. That’s for sure! Consider me one happy cookie monster. So…now we’ll talk ingredients and nutrition. One thing I love about Liz Lovely cookies is that they are real. No ingredient is processed or fake or made up of chemicals. You’ll recognize (and enjoy) everything that goes into her cookies. In the case of the Gluten-Free Cowboy Cookies, you’ll find: unrefined cane sugar, gluten-free rolled oats, rice flour, dark chocolate, palm fruit oil, walnuts, water, tapioca starch, xanthan gum, molasses, vanilla extract, sea salt, potato starch and baking soda. The ingredients aren’t a mile long…and, as I said…everything is recognizable and able to be purchased in your grocery store. LOVE IT! Now, let’s talk about nutrition. Do remember…this is a COOKIE and any way you slice it (in my case…in half) it is a treat. 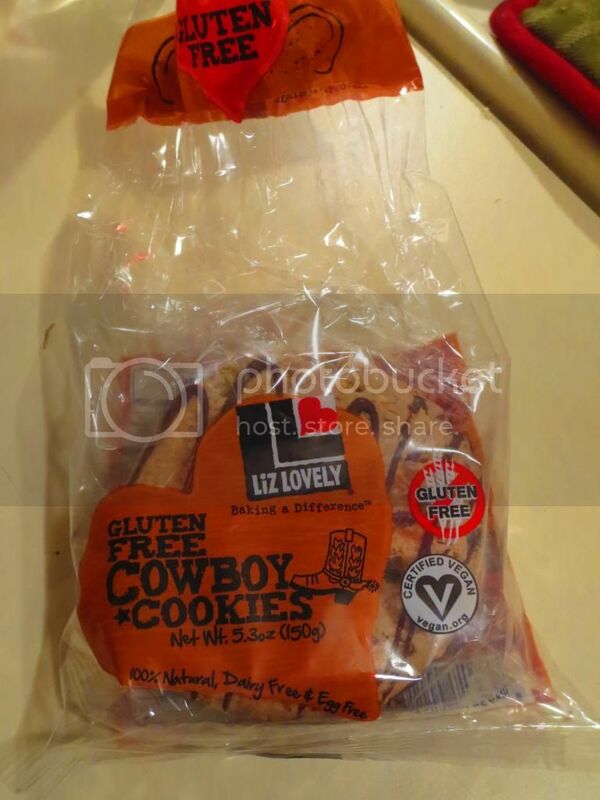 A serving size of a Liz Lovely Gluten-Free Cowboy Cookie is 1/2 of the cookie. This half will dish you up 180 calories and 8 grams of fat. This half of a cookie also contains 14 grams of sugar (I know…it’s a lot…but it’s a COOKIE!) and a mere 75 mg sodium. Not too shabby. And you’ll also be devouring 2 grams of fiber and 3 grams of protein. And these cookies are naughty and nice. Honestly. If you are going to splurge, I encourage you to find a store that sells Liz Lovely’s cookies and give them a try. I have yet to find any better on the market. They are soft, chewy, and just…amazing. And…if you can’t find them where you live, you can always order online. Do it. You’ll fall in love too. 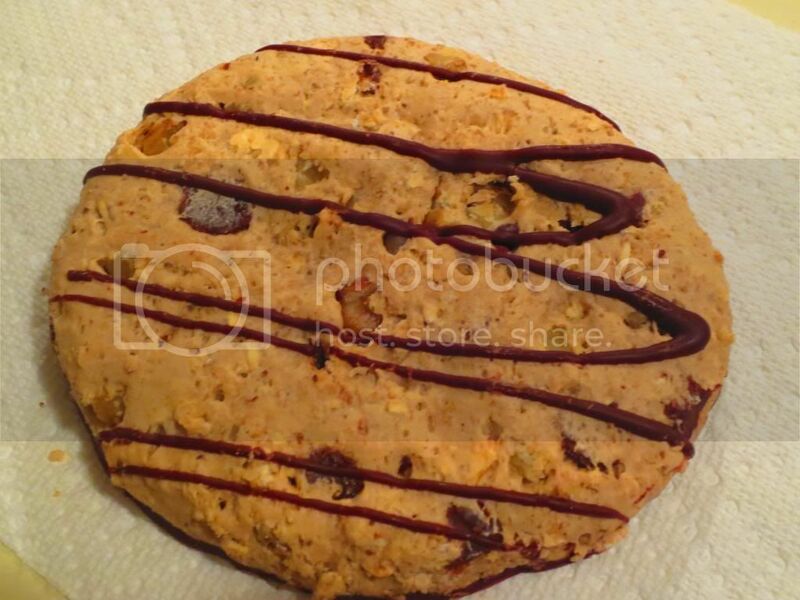 This entry was posted in Baked Goods, Chocolate, Cookies, Dessert, Food, Gluten-Free, Nuts, Oatmeal, Products, Review, Snacks, Sweet Stuff, Vegan, Vegetarian by The Celiathlete. Bookmark the permalink. Mmm…. I now have another brand of gf cookies to try!